Hello guys today's article is all about Xiaomi Redmi 5A and Redmi 6 specification and review. Flipkart is exclusivily selling this product It is budget sector oriented mobile. Redmi 6 is available in 4 colours Black, gold, rose gold and blue runs on Android 8.0 runs on Orio. Redmi 6 is mentioned to the side. It is built in India with basic information such as value, accessory, etc. but in reality it is assembled in India. Gold version of 3GB / 32GB version which we see in new MI mobiles phone, it is a gold version of metal that is quite compact and slim fit design. If we will talk about accessories build of both phones micro USB cable have good build quality. let's check another specification of the phones along with it we get a power Brick its a typical MI charger which is a simple charger no fast charging is enabled we can't expect fast charger in this budget range along with it we get a SIM ejecting tool. At the top we have a secondary noise cancellation mike with headphone jack, as well as 2 SIM tray micro micro port volume rocker and power on / off button, and behind us we have a dual camera with fingerprint scanner. Camera, speaker and auto brightness sensor. There is a dual camera setup of 12 MP Plus 5 MP, front camera has 5 MP camera, both camera shoots are in Bokay mode, it has a 720p HD + screen in which it has a 5.5 inch IPS display 3000 mAh battery. There is an intermediary Helio P22 processor in which it has 2 versions 3 GB / 32GB and 4 GB / 64GB, which is priced at 7,999 / - and 9,999 /. 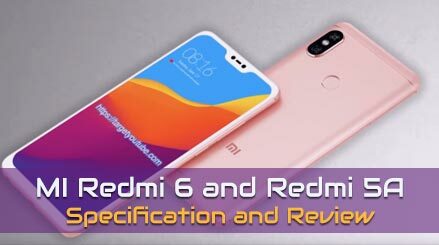 I hope that you like this article related to "Xiaomi Redmi 6 and Redmi 5A two cheap smartphones launch", which can be useful to you, we are coming up with more interesting topics like this, so keep looking and have a good day for next time.